Sturdy 'Traveling Collapsible Keyboard Bench' adjusts to three different height levels. 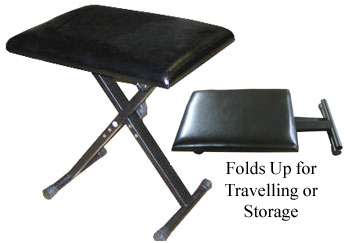 Folds up flat for convenient storage and travel. Available in black finish with a vinyl seat. Bench seat measures - 17" x 13"
It's light and steady. I use it as an alternate computer chair at work. The seat has a comfortable, firm cushion. Grandson is very happy with it.